The "Apollo 20" - An American-Soviet Classified Mission For An Abandoned Alien Ship On The Moon? An American-Soviet Classified Mission For An Abandoned Alien Ship On The Moon? Released Controversial Footages on YouTube - Leak of Information or Skilful Fake? 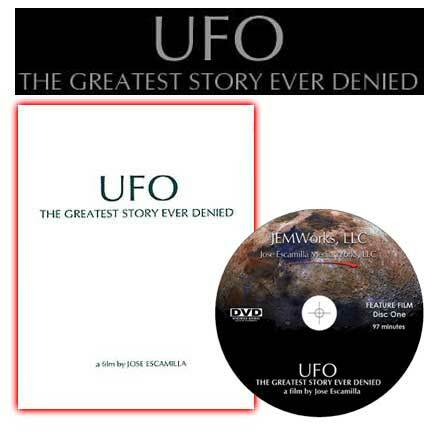 A recent controversial footage of about 6 minutes (which seems a digital transfer from a film, and that we can call the “Apollo 20 footage”) released on YouTube is causing amazement inside the ufological public on the Web, all around the world. The footage would be the presumed shooting realized during a NASA classified mission, in the ‘70s: the “Apollo 20” mission or, as it is suggested by the subtitles of the dialogues between the crew and the Mission Control, the “Vandenberg 20”. I remember to everybody that the last official landing mission on the Moon was the “Apollo 17” (NASA), which took place in December 1972, and that the Apollo 20 mission was cancelled by NASA in 1970. For sure, if the footage is not a hoax or a fake, the purpose of that mission would have been to shoot close to a mysterious object for understanding its origin. 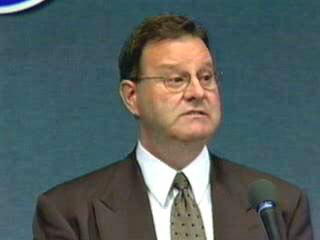 And, maybe, to organize a secret retrieval if possible. But the presumed footage of “Apollo 20” is not the only material which came out in the last days: it was also released by someone a presumed studio for the flyover of the assumed alien spaceship (available on YouTube a so-called preflight study for Apollo 20). And moreover on YouTube we have also several shots of the strange object on the backside of the Moon (whose numbers would be AS20-1020, AS20-1022 and AS20-FWD-7250). Regarding the video, as introduction we have a sort of marking (with the presumed logo of the mission) and, as result of a former recording on the tape, just a second of another marking about a video of the Apollo 11 Mission. So, if the first seconds seem not to be reliable but strongly contradictory, the following part of the video looks like interesting, well done and cohering with an old space hand-made shooting during a flyover of the Moon. Anyway, the video is an editing of at least two scenes, both of them apparently taken flying over the surface of the Moon. Is this man an American or Soviet former technician, who worked as insider during the 70s on Space classified missions and that now lives in Africa? Even the “Apollo 20 the legacy part 1 The City” (below video) is a very interesting and evocative footage. There is also the presumed lift off of the Apollo 20. Longitude: 117.5° E, Southwest of Delporte and North of Izsak. I have checked on a Lunar chart: it is on the backside of the Moon. 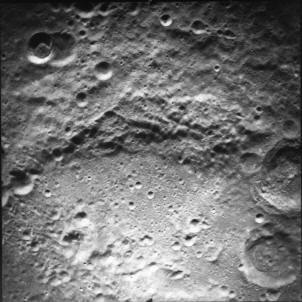 The official NASA photos are available by the website of the Lunar and Planetary Institute (LPI, in Houston), which is a “research institute that provides support services to NASA and the planetary science community” - (the AS15-P-9630 and the AS15-P-9625, from the the Apollo Image Atlas - below images). 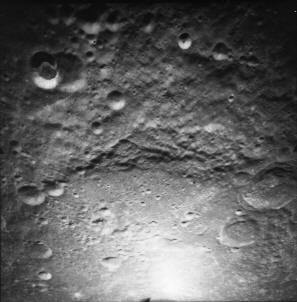 The pictures were taken in 1971 by Apollo 15, during the revolution number 38, from an altitude of 117 km. The two original photos have both the following features: Image Width: 45.24 inch - Image Height: 4.5 inch; Film Color: black & white. If you pay attention to the center, move a little bit to the right and zoom the picture, you can see the mysterious object. Now we can ask ourselves: does NASA classified missions really exist? Or did they exist in the past? The answer could be yes. First of all there are two sites for the launches of the Space Shuttles and of the spacecrafts generally: one is the Kennedy Space Center in Florida, and the other one is the Vandenberg Air Force Base, in California. Moreover there are several witnesses and references: one given by Clark McClelland (ex NASA engineer) and another one given by Robert M. Collins, former USAF Captain. 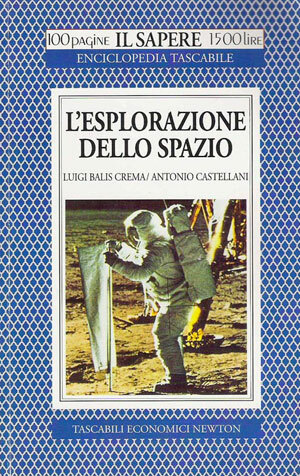 In Italy, for instance, I have found a very significant assertion made by two Italian university professors: Luigi Balis Crema and Antonio Castellani, both of them teachers at “La Sapienza” Rome University, Faculty of Engineering. "Infine nell’ultimo volo dell’anno il Discovery, con un equipaggio interamente militare, compie l’ultima missione “segreta” per conto del ministero della difesa USA ponendo in orbita un satellite 'spia' di grandi dimensioni che riceve anche dei segnali laser da terra." In the Italian text there is written that, regarding the 1992 year, the Shuttle Discovery made at the end of the year the "last 'secret' mission" for the DOD, with a "military crew". About the two NASA pictures, authentic and showing the strange object, I made a short analysis using the Gimp software (version 2.2.10): my purpose was trying to give prominence to the edges of the huge object leant on the Moon surface. 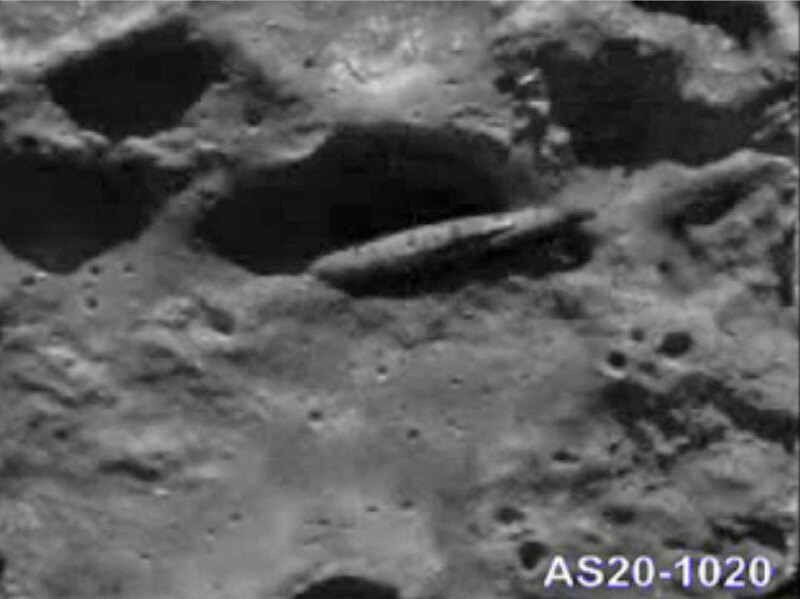 Apart from this controversial footage, it is undeniable that on that occasion in 1971, the Apollo 15 took pictures that showed a strange and cigar-shaped object, whatever it is. Somebody could object that a metallic artificial structure should appear different compared with a rocky surface. This is not the case, but the reflection of light on an ancient structure, maybe covered by dust raised in the past by impacts with asteroids and meteors, could be similar to that one of a rocky surface. 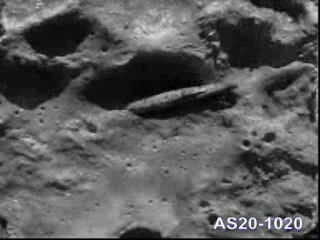 Even if it is a strange huge piece of rock leant by a crater, on the backside of the Moon there are anyway many strange objects. 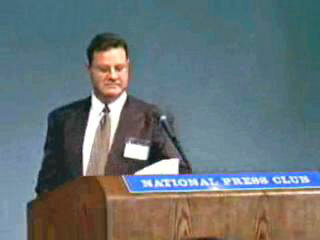 Karl Wolfe, retired Sergeant with a top secret crypto clearance for the US Air Force (at Langley AFB in Virginia), witnessed about them during the NPC press conference occurred in May 9, 2001, at Washington D.C.; the press conference was organized by Dr. Steven Greer (Director of the Disclosure Project). By the way, we've discovered a base on the backside of the Moon. After that, he showed to Wolfe photos taken by one of the Lunar Orbiter mission in which, according to Wolfe, there were structures half a mile in size. Some of them were buildings very tall, like towers; others were spherical and domed buildings, very large. 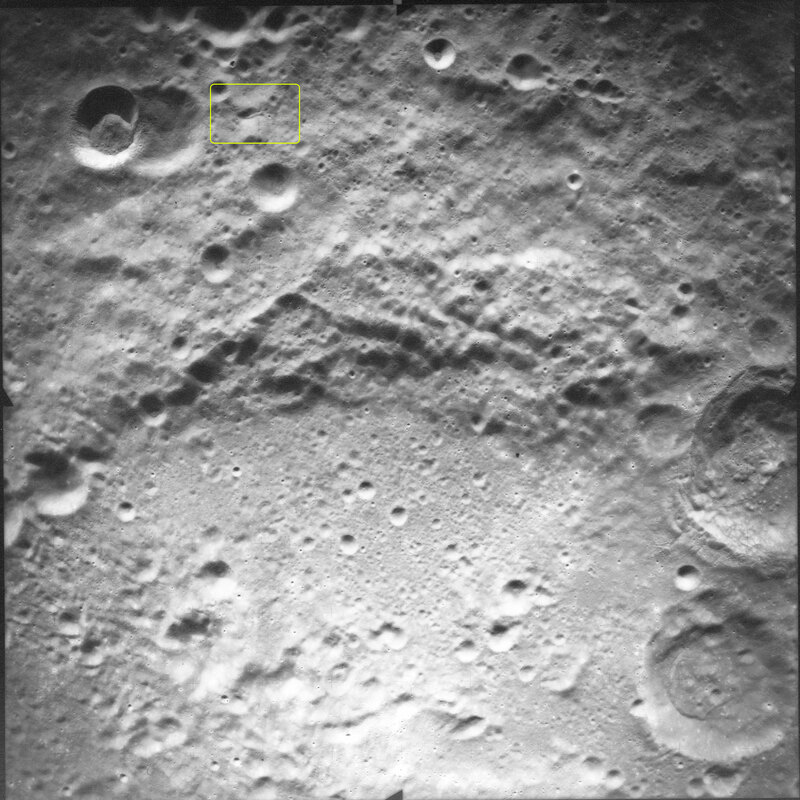 You will see some photos taken by the Clementine Mission, in which it is clear that some features were airbrushed by NASA.